After 14 day free trial. Search the 1940 US census free at Ancestry.com. Ancestry.com is the world’s largest website for family history records. With Ancestry you can access billions of genealogy records including Census, SSDI & Military records. Use an Ancestry.com coupon code to save money on a monthly membership. Start building your family tree today! Ancestry.com enables you to create and grow your family tree for free – from roots, to branches, to leaves, to blossoms (and even the occasional rotten apple), their program makes genealogy a breeze. At some point, all of us have had questions about our families’ histories that couldn’t be answered for one reason or another. Ancestry.com gives you the tools to answer those questions and unlock the secrets that have made it into what it is today. With a free online account, you can create multiple family trees for multiple family members, and with a paid subscription a vast vault of information also becomes accessible. Their 14-day free trial gives you a taste of all they have to offer if you subscribe: historical archives, census data, obituary indexes, military records, immigration documents, and thousands of registries from different states, provinces, counties, and countries. Ancestry.com’s easy interface and tools allow you to build your trees in a very straightforward way, learning as you go with no need for tutorials or instructions. “Auto-Complete” suggestions guide you all along the way as you search for long-lost relatives. When the program thinks it found something that applies to your tree, shaking leaves appear next to people's names that may be related to you, based on the info you’ve supplied. Another great feature is the ability to add your own stories and notes about people, explore associated maps, and even upload photos and audio. This comes in very handy when sharing your tree with relatives, who can help build it out, fill in the gaps, and add to their own trees. You also have the ability to export your family trees into graphic form to print out as “art” to hang on your wall – very unique, very eye-catching, a wonderful tribute, and a great source of conversation. Ancestry.com allows you to connect with your ancestors in a very real and meaningful way. Take advantage of this opportunity to become more aware of your family’s history. It’s free to get started and when you decide you want to explore and utilize all they have to offer, an Ancestry.com discount code will come in very handy, so use it. Your forefathers and mothers would be very pleased to see you using your money wisely. While you’re preparing to use Ancestry.com to create your family tree and discover your roots, first discover the answers to some of the questions that might pop up. We’re sure you’ll find them beneficial. Why isn’t my Ancestry.com coupon working? 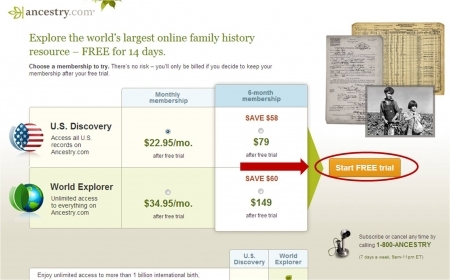 If you do ever find an coupon for Ancestry.com on our site that isn’t working for your purchase, double check that the coupon hasn’t expired, or that there aren’t any restrictions on how it may be used. Can I stack, or use more than one coupon? Maybe. All vendors and stores have different policies regarding this. The only way to find out for sure is by trying. Let us know if you’re successful so we can share your good fortune with others. Why can’t I find an Ancestry.com coupon for what I want? Probably because there isn’t one. Otherwise, you’d find it on CouponPal. We wish there were coupons that saved you money on everything. After all, helping you save is what we do. Keep checking back with us because if there are savings to be found out there, we will find them and share them with you ASAP. How do I contact Ancestry.com Customer Support? Clicking on the “Contact” link at the bottom of any page will bring a “Help” page with answers to FAQs, a well user forums. This is also accessible by clicking the “Get Help” link at the top of the page. If you can't find the solution to your issue online, you can call Ancestry.com’s Customer Solutions Associates at 1-800-262-3787, 7 days a week, 9am to 11pm ET. Can I buy the Ancestry.com software and install in on my computer? Yes. Click on the “Shop” button on the toolbar near the top of their homepage. This will open up a page where you can choose to purchase their software, or have it shipped to you. There are also helpful guidebooks there that are available for purchase. What is Ancestry.com’s cancellation policy? You can cancel (or subscribe) any time by calling 1-800-ANCESTRY, 7 days a week, 9am-11pm ET. For complete details, be sure to check their site. 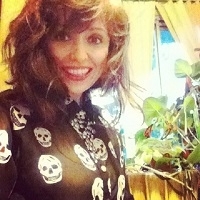 If I find a different Ancestry.com coupon or discount code, can I add it to your page? We here at CouponPal scour the web to find you the best deals available and then manually upload them to our site ourselves. We must make sure that all of our coupons are valid, so we cannot allow third parties to add codes to our store pages. But please, if you do find a great deal that we somehow have missed, email us at contact@couponpal.com and let us know. Ancestry.com and TLC have teamed up for a series called ‘Who Do You Think You Are?’ on cable TV. Each episode features a different celebrity as they explore the mysteries of their family’s past. The series is an adaptation from a British program of the same name. It actually ran on NBC for three seasons before being picked up by TLC for a fourth. Celebrities who are featured this season include Kelly Clarkson, Christina Applegate, Chelsea Handler, Zooey Deschanel, Chris O'Donnell, Cindy Crawford, Trisha Yearwood, and Jim Parsons. Watch as Kelly Clarkson learns that her great-grandfather worked with Abraham Lincoln’s party during the tumultuous post-Civil War years. Zooey Deschanel thinks that her great-grandmother was pretty. Good for her! The German-American Chelsea Handler finds out what her grandfather really did during WWII. For full episodes of ‘Who Do You Think You Are?’ visit TLC online or tune in on Tuesdays at 9/8 Central. The season four finale with Jim Parsons airs September 10, 2013. What if you discovered you were related to Henry VIII? Or Shaka Zulu? Or Catherine the Great? Or that guy or girl at Starbucks you want to hook up with? Or, all four? It’s possible, but without an accurate DNA test, finding out is virtually impossible. Use a an Ancestry.com coupon and sign up to get all your questions answered. Ancestry.com has been helping people trace their genealogy, build family trees, establish lineages, and connect with relatives for more than 30 years. Until recently, their extensive research tools scoured birth, marriage, and death certificates, census lists, and many other public and private records to help their members discover their family histories. In 2012, they added AncestryDNA, to analyze an individual’s genome by looking at more than 700,000 marker locations. Marker locations are basically DNA sequences with a known location on a chromosome used to identify individuals and species. This service includes the DNA testing kit itself, lab processing, and of course providing you with the results. Ancestry.com recently upgraded this service to improve accuracy and to expand the genetic net they cast to determine details about your ethnic origins. Using one of the most complete collection of DNA samples gathered from all over the world, they are now able to trace a person’s a origins to 26 global regions. This lets people explore their family’s roots in much greater detail that historical records alone can provide. If you’re interested in finding out more about all Ancestry.com can do, check out their FAQ page. All of their services are very affordable, and even more so when you take advantage of an Ancestry.com coupon code to save on accumulating a wealth of information on your family’s background. They’re so sure that you’ll become hooked on digging into your past that they even offer a 14 day free trial. After all, how can you know where you’re going if you don’t where you’ve been? Knowing something about your family’s heritage is a pretty special thing. Many of us have grown up hearing stories from our grandparents or parents, but very few of us actually know the history of our ancestors. Ancestry.com has become the go-to site for anyone wanting to learn a little more about the relatives that came before them. Their services make it really easy to locate valuable information (the process is more straightforward than searching through library archives like people used to do!) Here are five of the reasons we love Ancestry.com. It’s pretty crazy how fast Ancestry.com can provide you with accurate results. By simply providing your name, you can discover the basic branches of your family tree. Organizing your family tree is also a great way to figure out which relatives you’d like to learn more about. For just $19.99 a month, you can have full access to the site, so filling out your tree is an easy process. Want to know the date a family member immigrated to the U.S.? Interested in viewing the death certificate of a relative? Ancestry.com’s full records are set up so you can easily search through birth and marriage certificates, census and voter lists, and military records. All the information is available for the taking,and you’ll be able to more fully flesh out the history of your family with these tools. Ancestry.com knows how addictive it can be once you start researching your family history - you want to find out more and more! So, their Learning Center provides people with the opportunity to learn tricks and tips of the genealogy trade. A great option for further research is the collection of webinars. These videos cover topics like finding clues in census records and tips for successful searches. If your friends or family are interested in learning more about their ancestors, giving them the gift of an Ancestry.com membership is a great idea. They can dive into their history by receiving access to billions of documents! You can also give the Family Tree Maker software, which allows people to build their own family tree, and create and share reports with other relatives. Not everybody has the time to do all the digging that comes with discovering their roots. Ancestry.com provides users with the Hire an Expert feature. You can receive an immediate estimate by letting the experts know what kind of information you’re interested in. They’ll let you know how much it will cost, and then they’ll get to work researching what you’ve requested. Since these guys are professionals, they’re able to more successfully discover information that you might not be able to locate on your own. Hiring a genealogist to research your family tree is a great way to learn more about your background. By researching the past, we can learn more about our present. Ancestry.com makes it easy to learn all about your family tree, and with an Ancestry.com coupon code, you can save while you’re shaking those branches! So you want to find about about your family history, you have found an Ancestry.com discount, and signed up to explore your genetic history. What’s next? If you just search willy-nilly in the records at Ancestry.com, you might have trouble finding what you’re looking for. Here are the first steps you should take to start building your family tree. In the Ancestry.com Learning Center, you’ll find free informational videos and webinars to help you get started on the site and get the most out of your Ancestry.com membership. These videos will take you step-by-step, showing you how to navigate the site, how to search different types of historical records, and what to do with the information you find. Like any type of research, there’s a strategy to genealogical investigation. It’s worth your time to watch a couple of these videos so that you can keep your research organized and get the results you need when you search for records. Starting to fill in your family tree may seem like a daunting task, but you probably already know a lot more than you realize about your family. Start by entering yourself, your nuclear family, and everyone else you know of. Then you can start asking relatives for any more information they may have about the family tree. As you fill in information on your Ancestry.com family tree, you may see a little leaf symbol appear near some entries. This is an Ancestry.com “hint” – it means that the site has found someone in their records that may match your entry. You can use these hints to access the records and “grow” your tree even more. Using what you learned from the introductory videos, start searching the historical records at Ancestry.com. You can search specific records (birth, death, marriage, etc), specific locations, passenger lists, military, and school records. If you know one of your ancestors was written about in a newspaper, wrote a book, or was featured in a magazine, you can also use the advanced search option to enter keywords along with your search, so that you’ll find those kinds of records too. When you are scrolling through your search results, you may see some “Suggested Records” on the right side of the page. These are records that other people who viewed the records in your search results also viewed. It’s worth your time to take a look at these, because they may lead you to more discoveries about your family tree. The more searching you do, the further back in history you’ll go and the more you’ll find. Who knows – maybe you’re related to a king, a world-class criminal, or a great artist. You won’t know until you start searching! There’s always one person in the room claiming to have a great, great grandmother who was a full blooded member of a Native American tribe. But, how much of that is true, and how much is them wanting attention, or being misinformed by a well-meaning relative? There has got to be a way to prove once and for all that you are in fact descended from the noble Indians. There are a lot of reason to want to know for sure. Maybe you wish to obtain official status as a nationally recognized member of an Indian tribe. 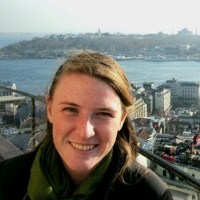 Perhaps you are seeking an extra edge in the college applications process. Or, you could have a loved one who tells a lot of tall tales, and you want to see if it’s true. So, how do you do it? According to the Office of Indian Affairs, a division of the US Department of the Interior, you need genealogical records to determine American Indian or Alaska Native ancestry. To qualify, the documentation must confirm the individual is of direct descent from a lineal ancestor (parent, grandparent, and so on) from a member of a federally recognized tribe. That means, their name must appear in the tribe’s records at some point. Since most tribes passed stories down through word-of-mouth, a lot of them did not develop written records until comparatively late in modern history. Documentation of your particular tribe may be spotty at best, depending on how many are actually still alive. (A lot of the smaller tribes have died off or assimilated to another culture; think Last of the Mohicans.) Therefore, the Office of Indian Affairs is not yet able to keep a national registry of every single Indian in the US. Even if there is no Indian relative search engine where you can enter your name, organizations like the Office of Indian Affairs and Ancestry.com offer helpful advice on where to find documentation. The first thing you should do is contact the Indian nation or tribe in which you claim membership, because they are responsible for their own record keeping. Note that the criteria for membership varies from tribe to tribe. They may take into consideration your tribal blood quantum, residency, or continued contact with the tribe. If you’re not quite sure what tribe to contact, there are places that you can start on the Internet. It’s an incredibly interesting topic for the amateur genealogist. All sorts of clues can be garnered from transcripts of births, marriages, divorces, or deaths. Suffice to say, there is not enough space here to go in depth on the topic of historical records. However, one of the best places online to gain access to such records is Ancestry.com. Simply by paying a membership fee, use their clear interface to search millions of old-timey parchments. 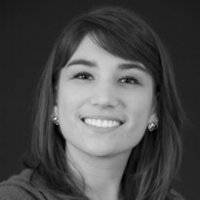 Ancestry.com has the time and know-how to explain the topic of historical documents in their blog that accredited experts wrote. They even have low-cost DNA tests, so you can scientifically determine if your DNA bears a hallmark American Indian signature (aka blood quantum). Most people have a basic understanding of their roots. They can tell you which countries their ancestors hailed from, and some might even know exact percentages. And don’t get me wrong, it’s great to even know that. But it’s even more incredible to know the names of distant relatives, what they did for a living, and perhaps the legacies they’ve left behind. It’s a special connection that forms instantly with just a little bit of research required. Here are five reasons a why using a coupon for Ancestry.com can help you give the best gift. 1. Thoughtful without requiring a ton of thought. Giving someone the gift of insight into their family’s past is a slam dunk. I doubt there’s even one person on this planet that has no interest in learning where they came from. The sentiment behind a membership to Ancestry.com is thoughtful, generous, and it’s probably one of the few gifts that isn’t a risk, based on your relationship to the recipient. There’s no wrong way to take a membership to Ancestry.com. It’s just an excellent gift. It isn’t a cordless phone, it isn’t a winter coat, and it isn’t a gift that the recipient will grow out of once they get older. It’s not seasonal. It’s valuable year-round. This is a timeless gift – perfect for Christmas, anniversaries, or birthdays. To fully embrace your future, you need to fully understand your past. Learning more of anything is good for you. But learning more about your roots isn’t just good for your brain, it’s good for your soul as well. 4. A gift that keeps on giving. Anyone that receives this gift will be blown away by what they learn. Finding out facts about your ancestors is something to brag about. And the more people receive this gift, the more knowledge is gained worldwide. And the more people that appreciate this gift, the more will want to give this a try too. Essentially, this is a gift that will make the world a better place. Can’t go wrong with that, right? 5. Get bang for your buck. Ancestry.com offers tons of ways to save. You can usually find a coupon for a free trial, and other Ancestry.com discounts. Compared to the amount of time you can spend at the website, it's a great value. It’s amazing what you can uncover in the sands of time when you get to digging with Ancestry.com. If you think a study of your genealogy won’t offer up any surprises, take a look at these incredible DNA revelations collected from Ancestry.com and Abroad in the Yard. Start your journey into the past when you sign up with Ancestry.com, and don’t forget to use an Ancestry.com coupon code when you do. 1. An American Indian in Iceland? In 2010 scientists found 80 living Icelanders who possessed genetic material similar to a variation found only in Native Americans. The Native American DNA probably entered the Icelandic bloodline around the year 1000 AD. The prevailing theory is that a Native American woman sailed with a Viking fleet returning from North American, and bore the first Viking-American baby. Although no living Native American group has the exact same genetic code found in the Icelanders, 95% of them have a similar variation. What scientists think is that the variation belonged to a Native American group that died out after the European occupation. Two men who had lived near what has since become a significant archeological site in Germany were genetically linked to the unearthed remains of the original inhabitants. The Lichtenstein Cave, as it is known, is located in the mountains of Lower Saxony, Germany, and had acted as an accidental mausoleum for 40 buried bodies nearly 3,000 years old. Out of 270 locals tested, Manfred Huchthausen and Uwe Lange proved a direct link to the Lichtenstein cavedwellers, which granted them bragging rights to the longest verifiable genealogies ever. 4. Two Men. One Signature. Same Person? Barbara Cobb Rowe’s great-great-great-grandfather Alexander Cobb signed his name with an X and a dot in each of the corners – the same way Sanders Cobb signed his name. A Cobb DNA family project collected genetic samples from a number of descendents of the Cobb line, and were able to deduce from the data that Alexander and Sanders were at the very least closely related. The project is still looking for a proven descendant of Alexander’s father William to uncover the identity of Sanders, and whether he and Alexander were the same person. Talk about an identity crisis. Almost as old as genetic testing itself is the hunt for evidence linking founding father Thomas Jefferson with children born to one of his slaves, Sally Hemmings. In the 1990s, scientists compared genetic material of five male descendents of Thomas’ uncle Field Jefferson (as Jefferson’s only child was stillborn) with that of the male-line of Eston Hemmings, Sally’s youngest son, to prove a closely related match. Paternity is all but certain. Who knows what you’ll learn about your family’s past when you start exploring Ancestry.com. Sign up today to find out, and use an Ancestry.com coupon code for once in a lifetime savings. Ancestry.com is the world’s largest website for family history records. Access billions of genealogy records of your loved ones. Once you've decided to embark on this amazing online journey into your family records, be sure to use an Ancestry.com coupon code to save money when checking out. 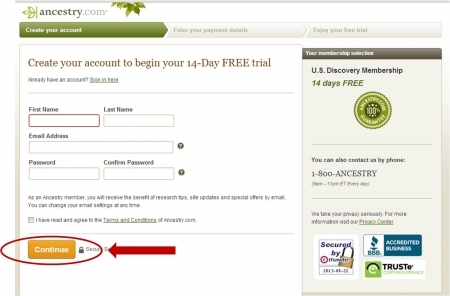 Below are step by step instructions on how to use and apply your Ancestry.com coupon code. 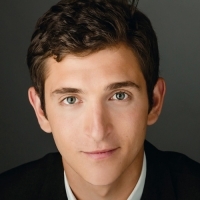 Locate the most attractive Ancestry.com discount and click it to activate the deal. 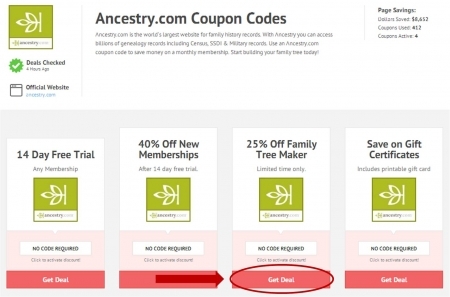 If the Ancestry.com coupon says, "No Code Required," it means the coupon or deal will automatically be applied upon your checkout. If an Ancestry.com coupon code has been provided, copy the code and leave the window open in case you need to refer back to it later. Ancestry.com will lead you to a specific sign-up page that corresponds with the coupon code that you clicked on. The page you are directed to will show you the subscription options to choose from. Use the radio button in front of the subscription you wish to sign up for, then click "Start Free Trial." Create your Ancestry.com account online starting with your First Name, Last Name, Email Address, and assigning a Password. Next, enter your payment details, then enjoy your free Ancestry.com trial.